This is an online C and C++ code browser. It focuses on improving the code navigation with proper semantic highlighting and tooltips. Enable faster understanding of code. Hover over a symbol to see the tooltip, or click it to see the full file. // If we're calling a dereference, look at the pointer instead. 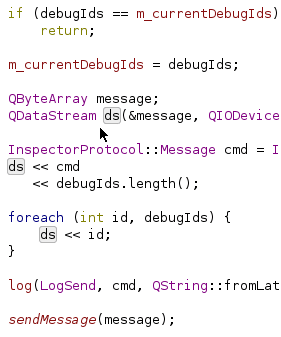 The Code Browser can be used as a Cross Referencer for C/C++ code. Hover over a symbol, and you can see its type, its documentation or where it is used. r: The variable is read. w: The variable is writen. c: The function or functor is called. a: The address of the variable or function is taken. For Qt signal or slots, this means a connection with them is made. m: A member of this object is accessed. The function signature contains the name of all the argument (useful to know what ', false, true)' means), in addition to the type of each argument and their default value if any. For enum constant you can see the numerical value. Clicking on a function brings you directly to the implementation. Just like normal URL, you can open it in a tab or new window and use the back button of your browser to come back where you came from. 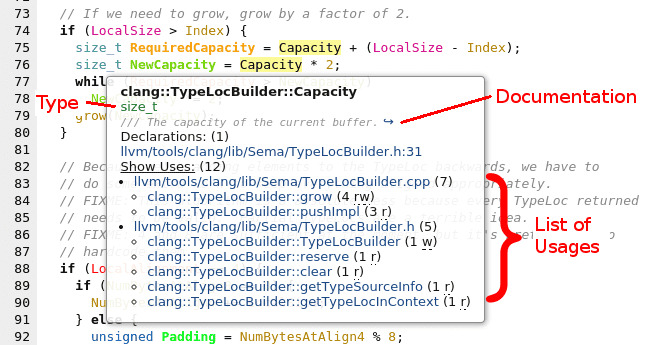 The tool-tip of a macro shows its expansion. Click on a macro to go to the corresponding #define. Sometimes, when you are reading the code of a long functions, you may wonder in which function you actually are. You can see the current function in the header. 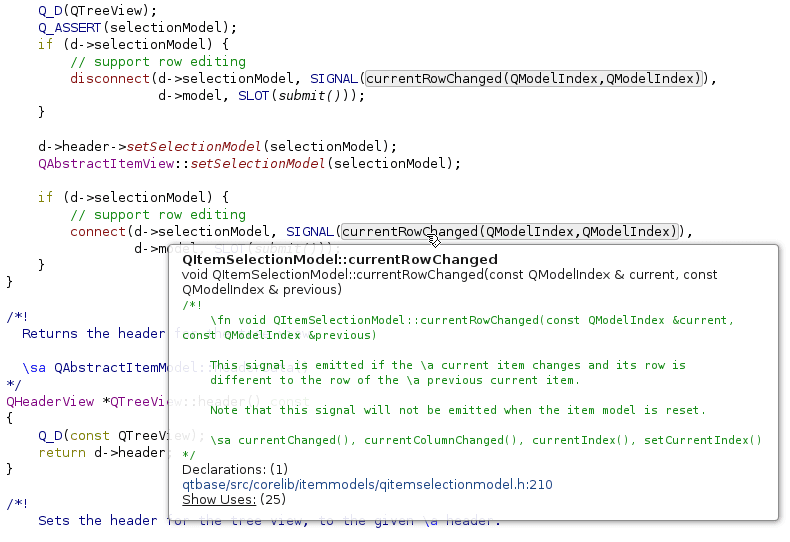 The Qt SIGNAL and SLOT macros are well supported. 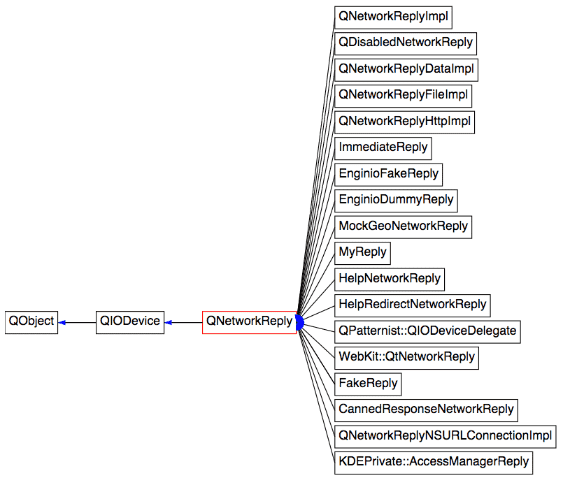 The tooltip of a signal show where you connect to it or emit it. Start typing the name of a file or the name of a function in the line edit at the top. Result will be auto-completed once you entered 4 characters. Jump directly to the file or that function. Link to specific line numbers or to specific function or class within a page to show the code to people on a chat or web page. 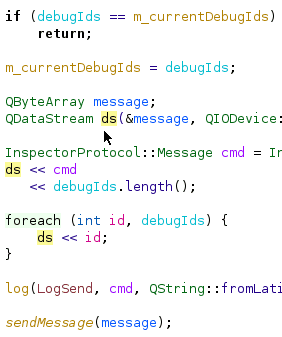 If you wish to copy-paste code, you may want to hide the line numbers. Just click on the link to hide them or show them again. Semantic highlighting makes reading a piece of code easier as it helps differentiating what is what. You can quickly differentiate local variables from member variables or global variables. Virtual functions are in italic. 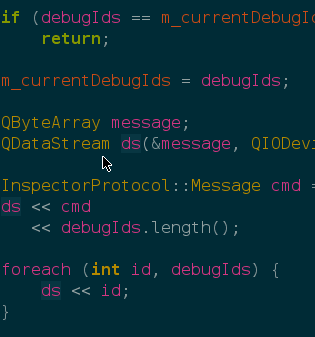 You can see what is a macros, a typedef, or a type. Different themes are available depending on your taste. Just pick one from the style combo box at the top right. Should I use this for our own software projects? The generator generates static HTML pages that can be served by any web server. It indexes and semantically analyzes the source code in the generation step, using the clang libraries to parse the code. It does not need a server-side database or CGI scripts, so it is easier to host. It can be run automatically periodically or with a hook on a version control or CI system. The generator runs on Linux or Mac and can be integrated with the build systems (CMake, QMake, others). → Read our more detailed explanation how the indexer works. You can also host on the public internet without changing or removing the Woboq branding. You can compile the generator yourself and try it on your own machine for 30 days. If you are interested in hosting a browsable version of your own C/C++ source code on your intranet, you can purchase a license of our code browser generator. If you are interested in the implementation, you can browse the sources of the generator using the Code Browser itself. Or clone the repository from github. You can report issues on the github bugtracker.